Here are a few of my observations about Pujo, Calcutta and India in general. 1. What’s the matter with Ma Durga being shown without weapons in Muhammed Ali Park ? (for you people for whom history starts with Sachin Tendulkar, this Muhammed Ali is not the famous boxer but one of the Khilafat movement leaders) What kind of liberal, pacifist horseshit is responsible for pigeons in the hands of the Goddess of Power? 2. What happened to Durga Protimas constructed based on the faces of film stars? Some people consider that blasphemy—I consider it fun. The Hema Malini/Sridevi/Madhuri Dixit lookalike Durgas—-aah the innocent 80s and early 90s. And I will never forget the Andy Roberts lookalike Asura and his cousin the Vivian Richards Asura……even though the West Indies were battering us in cricket, come Pujo and they would be groveling at the feet of our Holy Mother (who had badass spears and tridents in her 10 hands and not pigeons) ! This time I was expecting a Mallika Sherawat-Ma Durga and a Michael Jackson- Asura or at the very least an Asura with a ponytail called Murgasura (Chicken-Devil). But it seems our sculptors have totally lost their creativity. Now that deserved a somman from one of Ma Durga’s pigeons—“poo” I mean. 4. When we were in schools, people went to schools to study……disco dancing meant immediate rustication (no FIR, no police case, straight to “bhog of ma” as Mithun-da would say). One of our teachers was suspended for break-dancing in class —yes things were that strict. But now I see this monstrosity called “Syllabus-r Baire” [Out of Syllabus] a weekly television program on one of the Bangla cable channels where school kids , on school premises, in front of proud teachers dance tartily to the latest Bollywood numbers. WTF ! In our days “Out of Syllabus” was a phrase that carried with it sheer terror—those mind numbing , brain-darkening seconds as strange hieroglyphics stared at you from the question paper while the guy in the next seat, the one who goes to the “other tutorial” , smiled joyfully. Now “Out of Syllabus” conjures up pleasant images– coy school girls doing Britney moves, and guys flailing their hands in the air ala Sanjay Dutt in “Ishq Samandar”. The thin end of the wedge—-I swear. 5. Talking of schools, which genius opened a school for boys named after “Oscar Wilde” ? What next —the Michael Jackson Creche, Bill Clinton Girls School ? 6. Bengali cinema. Who is this new hero—the “Jeet” dude? Is he Bengali? He looks like a Sindhi guy for crying out loud. Give me Prasenjit any day—purple shirt and polka dotted bowtie dancing with Shatadbi Ray in a blue frock and pink ribbons. And give me Tapas Paul—-250 pounds of pure rocksolid flab and voluptuous man breasts dancing in the rain in a clinging “Punjabi” (what we Bengalis call Kurtas) while the comely Debasree Roy seduces him by singing “Aar koto raat eka thaakbo” (How many nights shall I spend alone?) [Movie: Chokher Aloye]. 7. Can someone tell me what’s happened to Amitabh Bachchan ? His KBC does well, he is in every other movie—which means he is making money. But then why oh why does he have to peddle everything under the sun—from soft drinks to detergents to batteries to stuffed toys? Yes stuffed toys—-I could not believe it when I saw on the door of the Archies gallery in City Center, a picture of the Big B cuddling a cute giraffe doll, entreating us to buy this overpriced piece of infantile junk. Is this what happened to the angry young man? Was this the same man whom we worshipped in “Deewar” and “Sholay”? The same man who used to be “rishte main baap” to all the pansy lover boys ? If he was , then why is he now cuddling up with a stuffed toy and that too an yellow giraffe ? Rajesh Khanna selling stuffed toys—I understand. 8. And talking about yellow and Big B, am I the only one who finds the Rin advertisement slightly uncomfortable? For those who have not seen it, it has AB playing the role of a white-cassocked Catholic priest who calls a cherubic little boy into his room , ostensibly to “interview” him. Then they have a rather curious exchange (details in the link above) where the kid tells the priest: ” Yellow yellow dirty fellow”. Yellow flag. The priest, it seems, is merely interested in knowing what detergent the boy is using. Now the red flag. The camera blurs and the priest is shown tickling the young boy…..remember the boy is here for an interview for admission. Now why should the priest start tickling him? In the context of what Catholic priests have been in the news for, I found it a bit…..”yellow yellow”. And please don’t call me the dirty fellow here. 10. “Fair and Lovely” —I knew of. But “Fair and Handsome” ? Wasnt the ideal of sexiness for men— “Tall Dark and Handsome” ? I am not complaining here—-its payback time for men for all the years of imposing an ideal of beauty that puts an inordinate premium on the color of skin. 11. And the howler. I have always enjoyed informercials—-the Bloussant breast enhancement cream (surprisingly castigated for “false and unsubstantiated claims“——-Tapas Paul could have saved them by his testimonial) remade in Hindi with an Indian “model” , tacky animation where the appendage in question is shown growing like Pinocchio’s nose (talk about false claims), and repeated use of the word “Sthan”. But this time, what took the cake and bakery was the infomercial for “Sukh Shanti Sangraha”—a package of punya or holiness for NRIs. Each package consists of 7 color coded dhoop-kathis (incense sticks)—-30 in each pack, one pack for every day of the week. Each of the packets has a specific purpose—one is used for “buddhi-labh” (knowledge), one is used for “dhan-prapti” (acquisition of wealth)….you get the message. And just in case you doubt the claims, there are actual testimonials of real customers who tell you how burning these incense sticks have changed their lives—-passing exams, getting married, business flourishing, family squabbles resolved. There is more. Besides these amazing burning sticks of bounty, you also get a vial of pure Ganga Jal and other assorted charms that guarantee your Sukh (happiness) and Shanti (Peace). Wait there is still more. The peddlers of punya are Arun Govil (last seen singing ” Ramji ki chiriya, Ramji ka ped, Khau Re Chiruyai, Bhar Bhar Pet) of Ramayana fame and Bhagyashree (last seen in “Qaid Main Hain Bulbul” with her fold-mountain hubby, Himalaya) —with their gentle voices, Sanskritized Hindi and enigmatic smiles touting the amazing miracles that the Sukh Shanti Sangraha will bring to your career and family life. Which begs the question: If the SSS solves all problems, why has it done nothing for the careers of Arun Govil and Bhagyasree—-their brand ambassadors ? BTW – I am really surprised that you were not asked baksheesh at Mumbai Airport. Last summer I was told – “Sir jaldi nikaal denge; Cut bhi bahut kam hain”!! Ya right. Sorry to ask a pointed personal question – South Pointer by some stroke of chance? If this has happened elsewhere, well, generic levels of individuals pervade the world…. This is my first comment towards anything you’ve written for that matter…..and I’ve got this feeling I know you somehow….no idea how and where though….. Sorry about the vernacular here, didn’t just feel like wasting the poetry through a rabid translation. Hilarious!! You have such a keen sense of observation and of course a great sense of humor. Are you this humorous at home? Then your wife must be a really lucky chap because to have a successful husband is not enough any more â€“ we need humorous husbands like you at home. 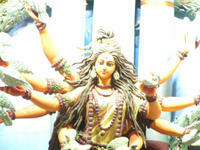 I agree with your observation that Ma Durga should be depicted according to the mythology that is with weapons and all. But that argument of yours contradicts the second point of MaDurga looking like film stars. She should be traditional not contemporary. My preference is the traditional look which arouses bhakti. But I donâ€™t mind having aasurs depicted like whoever we dislike at that time â€“ that is our way of getting back at our enemies!! Do you know that gents beauty parlours are mushrooming everywhere and having clients queuing up? And why not? In this age the mantra is men should do for women what women have been doing for men all these time including seduction by dancing. Donâ€™t you think that is why so many pop stars (western and Indian)/film stars are gyrating? hilarious! that was really great stuff. about the pujo just ignore the rest and follow gattu – they still have the asian paints awards, or dont they. out of syllabus? whats that? didnt get that angle. bachhan must be out of the red now ya! why is he still going on with his universal promotions? why do u like pallavi? The acceptance of ‘out of syllabus’ activities that you mention was one of the biggest changes I had noticed as well when I was last in Kolkata (earlier this year). I wonder what the reaction is from the leftist cultural czar’s – isn’t charges of ‘aposanskriti’ being bandied about ? Btw, is ‘Syllabus-er Baire’ the name of a particular program at some school/TV or just a generic thingie ? @SD: I suppose the Tshirts are a recent addition. @Anon: Yes of course! I am a South Pointer…..so obviously you know of the teacher concerned. But do tell me who you are…and we can find out if we really know each other. @yourfan: Yes I am this humorous at home or let me say I *consider myself* to be this humorous at home. My wife, of course, may not consider that to be a cause of her saubhagya because many times the humor is at her expense. She would prefer I take more responsibility for cleaning the house than wield a few thrusts with my rapier wit. And yes men are getting more conscious of their grooming post-Beckham and Salman has been seducing women with his bare torso for a few years now. @Prerona: “Out of Syllabus” is a weekly program on one of the Bangla cable channels (have clarified that subsequently in my post after your comment…it was not clear what it was when I wrote it ). Pallavi—of course I dont like her at all…..she is the queen of the “affected Bangla”….and talentless to boot. @Jatayu: Clarified what “Out of Syllabus” is in the post now. It was a huge culture shock to me especially as I remembered all the instances when people were kicked out of our school for far less displays of “oposanskriti” than what they tomtom on prime time TV protected by the label of “extra curricular activities” with official endorsement. Not that I am complaining about the dances. hmmmm, would have been interested in one thing. what did u feel about the new Calcutta and the metamorphosis of the “Budhhist” left?? if not anything, u must atleast have noticed the flyover in Gariahat.Thats probably the most significant change in Calcutta’s geography in the past few years. at the very least an Asura with a ponytail called Murgasura (Chicken-Devil). 1. jeet is indeed sindhi. or is he punjabi? jai hok, you were right, he’s not bong. 2. oi syllabus thing was probably called syllabus e nei earlier. jai hok, much fun. onek dhonnyobad. ki bhebechho tomra? ‘let there be a blog…and then not do ennything about it’??? yaarki? you shall be nice and post your blogmeet article, AND all your calcutta/bengali/mithunda posts by tomorrow noon. Our asur looked like our local councillor. Totally un-intentional. You are the THE,yo. aap ki koi vishesh tippani? AB posing with a giraffe is straight out of his movie Waqt. Oscar Wilde School for Boys!!!!!!!!!! Why am I not surprised. While travelling by train from Howrah to Delhi I saw a St. Jesus School. Also, this disco dancing fad is quite crazy. My parents would have been horrified if we danced in anything apart from Tasher Desh in public. Calcutta has seriously changed so much. Almost didnt recognize Gariahat More..what with flyover and all..
Let “Arnabian” Random Thoughts prevail. @Anon1: I am thinking of coming up with another post about Buddhadeb and Kolkata’s new look. @Rimi: Na na I did not copy it from you….I actually saw this ad on Ashtami…I think somewhere near Ballygunj Phari…and I think the name is still “Syllabus-e Nei”…my mistake. And wrt Kolkata blog…shall put up the posts…but one thing…wont a link to the original posts do? @Srin: My local councillor (or used to be) a guy called “Durga Mukherjee”…go figure. @Anon: Yes I normally dont like unrelated comments but okay here goes. It’s an interesting concept though I never understand the number “6” ? Why not “5” ? Why not “7” ? Maybe a post on this is in order—shall do. @gvenum: This insult shall obviously be replied to. @Anon2: Ok I havent seen the movie but why is Big B doing such anti-image stuff—isnt image everything? @Rita: Amazing stuff. I wasnt in Kolkata for the idol made out of tyres but the other innovative materials used to make protimas was indeed awe-inspiring. Too bad the Western world never gets to see these mind-boggling works of sheer splendour and simplicity. @Red: Exactly…dancing in Bengali families and schools—a strict no-no. Only relaxed for ‘Bhashans’. churanto neka….to the point of retardation. @Anon: Oh yes I do “know” the teachers in question and what connects them…though I would like to say that girls were not losing their virginity at the age of 12….oh no man. Maybe 14 or 15 but not 12. As to molestation….whats that about? Never heard of such a thing in my alu mater. Simply brilliant. Being a Kolkata niwasi myself, I could connect to everything. Though I was in South Point! i think this “jeet dude” is cool! at least different than those flaby-chuuby/buro khoka gulor theke better!